I’m probably not the best person to review this book, since I’m not Jewish and this book is about the celebration of Passover in early 20th century St. Louis. Still, ever since my daughter attended a Jewish preschool last year, I’ve been on the lookout for a vegan-friendly Passover book, and at last I’ve found one! 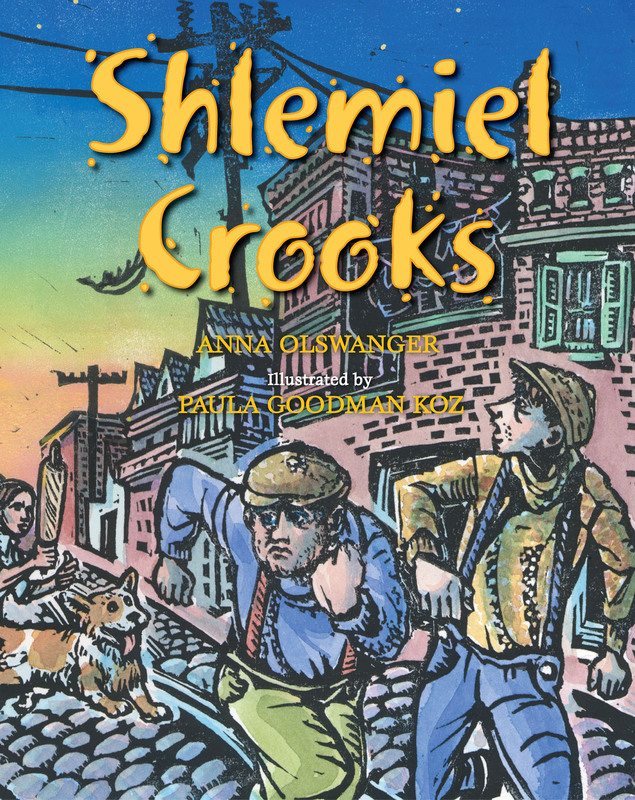 Incorporating a conversational tone and snippets of Yiddish, Anna Olswanger’s book recounts the true story of a failed robbery of Passover wine in 1919. Complete with an appearance by Pharaoh, a talking horse, and a nice helping of Exodus, this book has a lot of character and not a single mention of fish, meat, or eggs. It’s a great book for vegetarian and vegan kids! Ages 5-9. 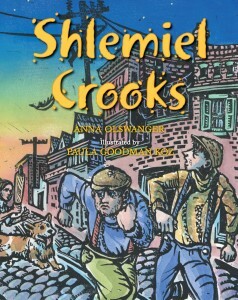 For a guide to the book, visit the Shlemiel Crooks website. Jessica, I just discovered your review and wanted to let you know that the reason there’s not a single mention of fish, meat, or eggs in Shlemiel Crooks is because I’m a vegan. Thanks for making note of the book being great for vegetarian and vegan kids! I hope a new crop of kids will discover the book this Passover. Anna, that’s wonderful! Thanks for letting me know. Hi there congratulations on a truly unique blog, and such a great resource for vegan and vegetarian families. I enjoyed your review of Anna’s book. I have also read Anna’s book Greenhorn recently and was moved to tears. Thanks for linking this up to the Kid Lit Blog Hop! This is an awesome blog with so many great resources! You have a very interesting blog – I had fun looking at your very ecclectic posts. What a great resource. Thanks so much for linking up into the Kid Lit Blog Hop!